With an angle of view equivalent to 14-28mm on full frame, the 7-14mm is the joint-widest rectilinear lens for Micro Four Thirds. It has a constant f/2.8 maximum aperture, which is good for low-light work, and can be stopped down to f/22. The minimum focus distance is just 0.2m, giving scope for interesting wideangle close-ups. The 7-14mm uses a complex optical formula with 14 elements in 11 groups, packed full of exotic elements. Two aspheric extra-low dispersion ED glass elements and a dual-sided aspheric element reduce distortion and peripheral aberrations, while three super ED glass elements, 1 ED glass element, and 2 high refractive index glass elements are used to minimise chromatic aberration. Olympus’s ZERO coating is employed to combat flare and ghosting, and the lens has an integrated hood. Autofocus is handled by a stepper motor, and is lightning-fast, extremely accurate, and practically silent. Panasonic users should note that there’s no optical image stabilisation, because Olympus uses in-body systems instead. Anyone familiar with the Olympus 12-40mm f/2.8 will immediately recognise the 7-14mm as part of the same family. It uses almost exactly the same design language, with a solid-feeling metal barrel and finely ridged metal zoom and focus rings. The manual focus ring uses the same push-pull design as the 12-40mm too; pull it back towards the camera body and it reveals a distance scale, giving a traditional manual focus experience with hard end stops, despite its electronically-coupled focus-by-wire design. Turning the ring engages whichever focus aid you’ve selected on the camera body, either magnified view or peaking. Both the zoom and focus rings turn smoothly and precisely, with all the precision we’d expect from a ‘pro’ lens. Measuring 79mm in diameter and 106mm in length, the 7-14mm turns out to be almost exactly the same size as the 12-40mm when the latter has its lens hood attached and is set to it shortest physical length (16mm position on the zoom). But at 540g it’s considerably heavier, with the additional weight front-loaded in the large domed front element. Zooming and focusing are both internal, so the lens’s length and balance on the camera never changes. The barrel hosts an L-Fn button, whose function can be customised from the camera body. A rubber seal around the lens mount helps to keep out dust and water. 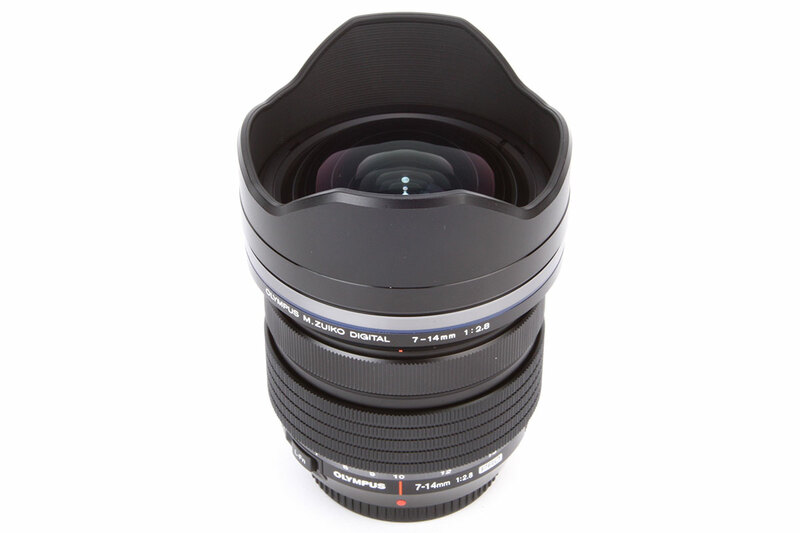 As tends to be the case with lenses this wide, there’s no provision to attach filters, either at the front of the lens or behind the rear element. However we expect to see third-party adapters for square filter systems from the likes of Lee appear sooner rather than later.